Preface. Contents of volumes 1-11. 1. Giant magnetoresistance in magnetic multilayers (A. Barthélémy, A. Fert, F. Petroff). 2. NMR of thin magnetic films and superlattices (P.C. Riedi, T. Thomson, G.J. Tomka). 3. Formation of 3d-moments and spin fluctuations in some rare-earth-cobalt compounds (N.H. Duc, P.E. Brommer). 4. Magnetocaloric effect in the vicinity of phase transitions (A.M. Tishin). Author index. Subject index. Materials index. This volume is composed of topical review articles written by leading authorities in the field. As in previous volumes in the series, each article presents an extensive description in graphical as well as in tabular form, placing emphasis on the discussion of the experimental material in the framework of physics, chemistry and material science. Chapter one focuses on GMR in magnetic multilayers, spin valves, multilayers on grooved substrates and multilayered nanowires. Furthermore it comprises theoretical models and employs the experimental data to discuss the current understanding of GMR and the underlying physics. A key aspect of the study of the properties of thin magnetic films and multilayers is the relationship between the structural and magnetic properties of the material, which has become one of the most active areas of research in magnetism in recent years. NMR is a well-known technique that offers the possibility to obtain experimental information on atomic scale properties in systems with reduced dimensionality. Chapter two reviews the results obtained by NMR on the latter systems. 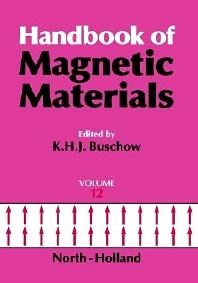 Written in tutorial style it will be helpful to scientists familiar with the preparation and properties of thin magnetic films but having little knowledge of the NMR of ferromagnetic materials. Chapter three examines rare-earth compounds with 3d transition metals, in particular those that exhibit a magnetic instability of the 3d-subsystem. It focuses on such compounds in which the d-electron subsystem is neither non-magnetic, nor carries a stable magnetic moment. The last chapter is concerned with the promising technology of magnetic refrigeration which can be used in a broad range of applications. It is based on the magnetocaloric effect associated with the entropy change occurring when a magnetic material is isothermally subjected to a changing magnetic field and the temperature change when the field is changed adiabatically. The last decade has witnessed quite a strong development in magnetic cooling technology and research activities in this field have been extended to a variety of magnetocaloric materials, including amorphous alloys, nanocomposites, intermetallic compounds and perovskite type oxides. The many materials, their magnetocaloric efficiency as well as the physical principles behind it are reviewed in this final chapter.